Our elevating offal cart brings new convenience to viscera inspection and handling in the small slaughtering plant. Economical, too, because readily available water power is used to elevate the viscera tray. With the stainless steel tray in the lower position its flat bottom is only 15 inches above the floor – low enough for easy positioning under a hanging carcass. 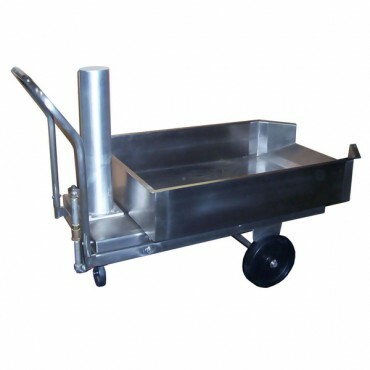 After eviscerating the carcass, and collecting the offal in the cart, the cart can be rolled to another area and the tray elevated for easy viscera inspection and removal of editable parts. The cart can then be moved in the raised position to the inedible products room where the operator pulls the paunch forward and empties its contents into a barrel, then moves to another barrel for removal of the remaining offal. In the raised position, the trap lip is 37 inches above the floor to clear the top of a 55 gallon drum. Cart frame is stainless steel for long service, free from cracks and crevices.